Jewish Humor Central: Jerry Lewis Celebrates 50th Anniversary of "The Nutty Professor"
Jerry Lewis Celebrates 50th Anniversary of "The Nutty Professor"
Jerry Lewis was honored in Hollywood last month on the 50th anniversary of the release of his classic funny film The Nutty Professor. The film is a parody of Robert Louis Stevenson's Dr. Jekyll and Mr. Hyde. 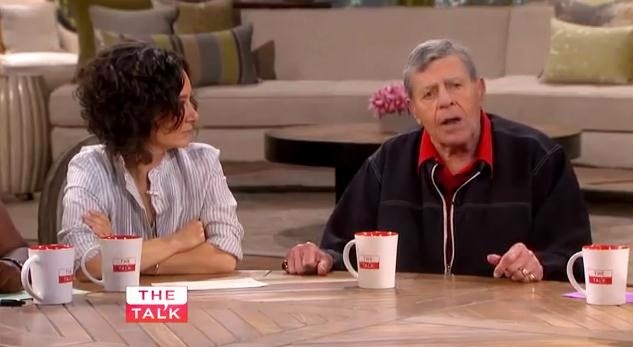 Interviewed on the CBS weekday TV show The Talk, the 88-year-old Lewis revealed the details of the character and script development that went into the film. The 50th anniversary 4-disc DVD set was released last week and is available on Amazon.com and on Netflix. Lewis, born Joseph Levitch in Newark to Russian Jewish parents, also talked about his secret friendship with President John F. Kennedy and Robert Kennedy. The president hosted him eleven times in the White House without the press knowing that he was there. "There are three things that are real: God, human folly, and laughter. Since the first two are beyond our comprehension, you must do the best you can with the third." Judging from the successes of his long show business career, it would seem that Jerry Lewis listened very carefully to this advice to the delight of audiences everywhere.